Delicate and inviting yet strong and durable, the Amish Sheffield Pencil Post Bed brings lovely shaker style furniture to your bedroom collection. The Sheffield Pencil Post Bed features long and slender bed posts with decorative and pointed tips. The solid wood headboard offers simple curvatures that add to its gorgeous display. With long posts thin and graceful, this solid wood bedroom furniture is simple elegance at its finest. Shaker style furniture is known for its no frills approach, allowing the quality materials and expert craftsmanship of the style to truly stand out. Enjoy the form and function of the Sheffield Pencil Post Bed paired with matching items. We offer the Amish Sheffield Gentleman's Chest, the Amish Sheffield Two Door Nightstand and the Amish Sheffield Three Drawer Armoire to complete this shaker style bedroom collection. Select the options you're looking for to style the Sheffield for your bedroom. 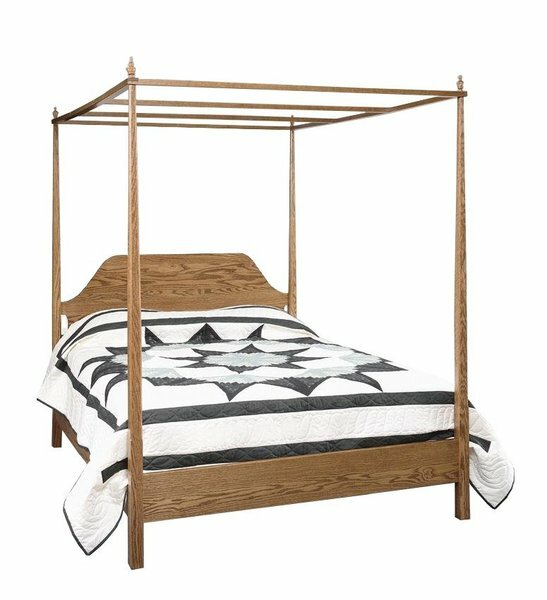 Bring home a solid wood bed like the Sheffield for sensational shaker style furniture, function and durability you can count on and a comfortable and stylish bed that will last. Call today with any questions about our solid wood bedroom furniture. Toll-free at 866-272-6773. Our team of specialists can also be easily reached through email at Questions@DutchCrafters.com. Standard Footboard Floor to Top of Footboard Height: 16"
Standard Footboard Floor to Bottom of Footboard Height: 8"
Low Footboard Floor to Top of Footboard Height: 16"
Floor to Top of Side Rails: 13 3/4"
Floor to Bottom of Side Rails: 7 3/4"